In industrialised countries, cardiovascular diseases are widespread and are amongst the most frequent causes of death. In particular, increased cholesterol and triglyceride values in the blood are risk factors in this case. Along with an unhealthy lifestyle, genetic changes may also cause an increase in blood lipid levels. Apolipoprotein E (ApoE) is, for example, also affected by such changes. ApoE is a protein that plays an important role in lipid metabolism. As a component of chylomicrons and the lipoprotein VLDL, ApoE is responsible for the transport of cholesterol and triglycerides in the blood. In addition, ApoE serves as a ligand for the LDL receptor and thus permits the metabolism of this triglyceride- and cholesterol-rich lipoprotein. As a result of genetic changes, three different forms of ApoE appear: ApoE2, ApoE3 and ApoE4. The normally functioning ApoE3 differs from the two “defective” forms in each case by only one amino acid, which however leads to considerable lipid metabolism disturbances. In the homozygotic presentation, the ApoE2 allele is associated with type III hyperlipoproteinaemia. This clinical picture leads to an increased risk of arteriosclerosis. Testing for the presence of the ApoE2 allele can support the diagnosis of type III hyperlipoproteinaemia and should be performed if the disease is suspected. Even in the case of ApoE4 allele carriers, there can be after-effects on health due to disrupted lipid metabolism. Carriers of this allele are exposed, for example, to an increased risk of coronary heart disease. Therefore, for patients with increased cholesterol and triglyceride values, gene typing is likewise recommended in order to clarify any genetic causes. In addition, the ApoE4 allele can provide additional information, since an association with Alzheimer’s disease has been shown. Our GenoType ApoE test system allows you to have definitive detection of the three alleles which lead to the forms ApoE3, ApoE2 and ApoE4 and supports you in the diagnosis of the known diseases. No limitation: biochemical methods to detect the various forms are complex and susceptible to faults. 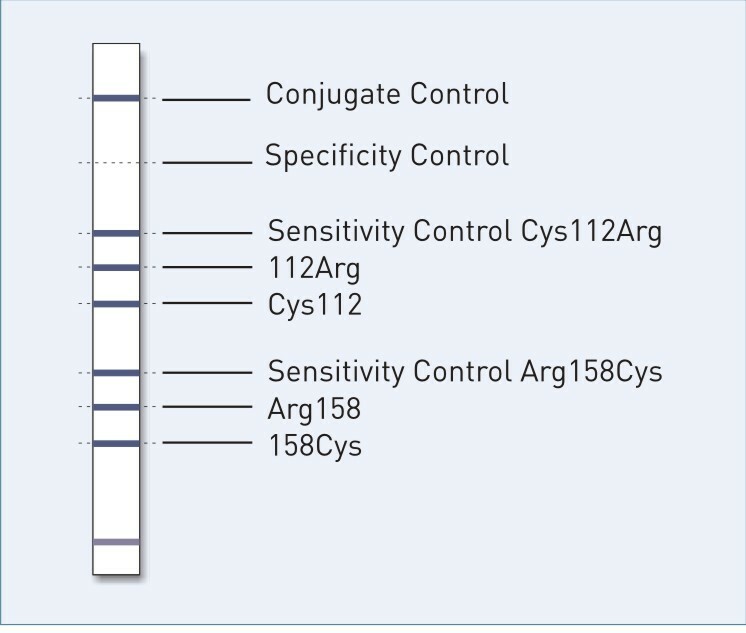 With genotyping, by contrast, you obtain reliable results rapidly. Cost-effective: no costly equipment needed to perform the testing. Simple evaluation: evaluation is done using an evaluation template; an interpretation table shows the associated phenotype.